To celebrate the home entertainment release of Maze Runner: The Scorch Trials, out now on Digital HD, Blu-ray and DVD, let’s take a look at the rise of YA films over the years. Based on the novels by Stephenie Meyer, Twilight was the first of five films in the Twilight Saga about the romantic relationship between a Vampire and a teenage girl. The film starred Kristen Stewart and Robert Pattinson as Bella and Edward. The final film in the enormously popular franchise, Harry Potter and the Deathly Hallows Part 2 acted as an end of an era to many fans. It appealed to a huge audience who had grown up along side the characters for ten years. Originally a book by Stephen Chbosky, The Perks of Being a Wallflower gave a sensitive and touching account of a shy and awkward teenager and stars Logan Lerman and Emma Watson. Based on the novel by John Green, The Fault in Our Stars follows the emotional journey of sixteen-year-old cancer patient Hazel Grace Lancaster (Shailene Woodley), who meets and falls in love with Augustus Waters (Ansel Elgort). Another YA film based on a novel, The Maze Runner was the first instalment in the series. 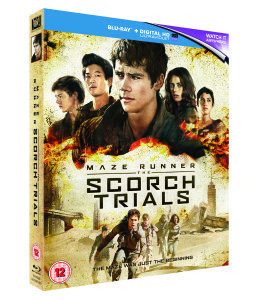 Featuring a talented young cast, including British actors Thomas Brodie-Sangster, Will Poulter, and Kaya Scodelario, the film follows Thomas (Dylan O’Brien) as he tries to escape from a maze after his memory is erased. Thomas (Dylan O’Brien) and his fellow Gladers face their greatest challenge yet: searching for clues about the mysterious and powerful organization known as WCKD. Their journey takes them to the Scorch, a desolate landscape filled with unimaginable obstacles. Teaming up with resistance fighters, the Gladers take on WCKD’s vastly superior forces and uncover its shocking plans for them all. Starring Dylan O’Brien, Kaya Scodelario, Thomas Brodie-Sangster, Giancarlo Esposito, Aidan Gillen, Barry Pepper, Lili Taylor and Patricia Clarkson. Maze Runner: The Scorch Trials is out now on Digital HD, Blu-ray and DVD.